There are times in life in which the danger of getting lost in too many projects is great. For some of us this may even be a permanent condition. All the things we could and want to do just won’t fit into the hours of the day, the days of the week, months, year. New ideas keep coming up and as we’re starting with another new “thing” we put the other projects aside, just for now. Unfinished business. We put this off until next week, do a bit of the other, begin something new and meanwhile forget about our priority projects, deadlines and goals. I like to view all the projects and tasks of my life as little satellites that keep circling around me. Sometimes they are where I can see them, sometimes they are behind my back. The more satellites I have, the more confusing things can get and the greater the challenge of keeping track of everything on the to-do list. Some of them, the ones that are more urgent or the ones that I think about more often, have a smaller orbit. Others have a larger orbit, I therefore see them less often and they are further away from me. But every now and then they zoom past my eyes and remind me that they’re still around. They wave and smile with an enthusiastic: “Hello, I’m unfinished business!”, “Whoohooo, I’m still around!” or “You didn’t get this done yet, you didn’t get this done yet!” Quite annoying at times. The key is to reduce the number of satellites in order to be more focused. Take them down by finishing them one by one. Make a list if it helps. 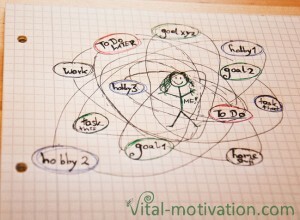 Get an overview of what’s actually circling your orbit and then go for it. Tackle your larger tasks and goals one by one. The less multitasking you have, the more focused you are and the quicker you’ll be done. 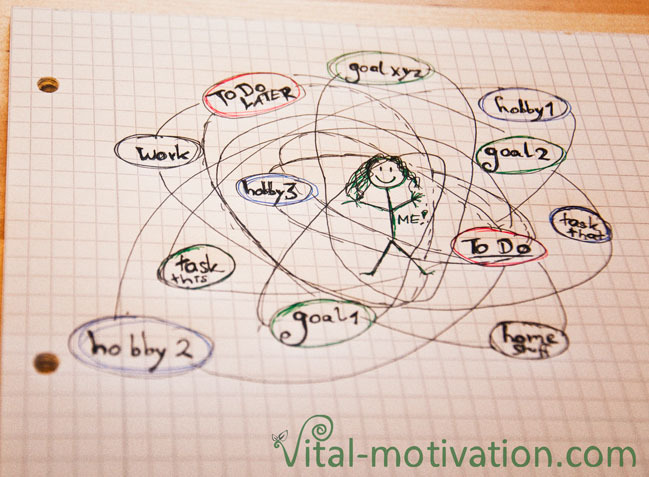 Keep track of your long term tasks and give them a clear place in your life where you can pursue them with regularity. Throw out those which you don’t need anymore or which aren’t important at this time. Be honest with yourself about your projects. How many are there which you actually want to be doing at the time? What about the others? Sometimes we keep projects on our list because we think we have to finish them because we started them. If they don’t work for you anymore- out of whatever reason – throw them out of your agenda. Finish them by letting them go for good. If there are projects that you’d like to do, but definitely not now – put them aside until you decide that their time has come. If you (like myself) have many projects which you pursue you can for example only assign one of them for each day of the week so you’ll stay focused – or reserve specific times of the day for these things. Monday evening for writing your novel, Tuesday evening for working on your painting, Wednesday for fitness or however it works for you. Next post: Affirmation of the Week: Rise and…. ?